Is Charlie Ergen giving up on his wireless plans? An interview with Bloomberg published this morning seemed to signal a change of stance, particularly the explicit suggestion that Ergen would be open to simply selling his spectrum to AT&T, when his (coded) message for the last year has been that AT&T would need to buy the whole of DISH (at a huge premium). Not only has the Softbank deal enabled Sprint to escape from the box DISH had been trying to put it in, but by buying McCaw’s stake in Clearwire, and indicating to other strategic investors on the board that further equity purchases are up for negotiation, Sprint looks to have headed off Ergen’s planned deal to purchase assets from Clearwire. Despite this, perhaps Ergen could still do a deal with other partners like Carlos Slim or DirecTV, but it is harder to see the rationale for investing in building a fifth competitive operator than it was a month ago, when Sprint (and perhaps even T-Mobile) were perceived to be in a much weaker competitive (and financial) position. In addition, we may be seeing AT&T attempt to warn off Carlos Slim from a deal with Ergen, in the form of mutterings about foreign ownership of other wireless operators. So it looks like Ergen may now turn his attention towards a potential merger deal with DirecTV. In the short term that means putting pressure on DirecTV to come to the table, most obviously by competing with them in Brazil. Indeed, Echostar told the FCC at the end of September that it planned to move the Quetzsat satellite to the 61.5W slot, freeing up AMC-15 to be relocated to 45W in order to provide service into Brazil “as soon as January 2013“. Wireless and broadband could also be a key part of this deal, via an alignment of both satellite TV operators with AT&T, similar to the Verizon-cable TV partnership, and that would be cemented by the sale of DISH’s spectrum to AT&T. Nevertheless, I would expect the sale to come ahead of an agreement with DirecTV, simply because being left out of a DISH-AT&T alliance would put even more pressure on DirecTV. As I noted last December, this alignment would cement AT&T and Verizon’s market leadership. However, given that the FCC backed off mandating wholesale access as a condition of approving the Verizon/SpectrumCo deal, the only plausible way to promote competition to these two players may then be to allow Sprint and T-Mobile to merge. Of course putting a price on DISH’s spectrum is hard, but I suspect that the most appropriate comparison for the AWS-4 spectrum is the WCS band which AT&T purchased recently, because neither band is usable immediately (unlike AWS). AT&T paid NextWave more than expected for WCS, but this was offset by the fact that AT&T already owned a substantial part of the band, for which it had paid very little. I would therefore expect an AWS-4 sale to be at a fairly similar price to that AT&T paid NextWave for the usable parts of the WCS spectrum: somewhere in the range of ~$0.30-$0.40/MHzPOP (depending on how much value is attributed to the C/D blocks and AWS holdings), i.e. of order $3.75B-$5.0B plus perhaps another $1B for DISH’s 700MHz E block spectrum. Today the House Energy & Commerce Committee has released the documents from last month’s hearing, which makes for some interesting reading. That $12B valuation of course is the same as LightSquared’s economic consultants used, back in June 2011, to estimate that the January 2011 waiver was worth $10B to LightSquared. The documents also indicate (p10 of the PDF) that the FCC Chairman was warned in September 2009 about the “equity considerations of providing a ‘windfall’ to companies who did not acquire the licenses at auction” and even at that time “changing the ATC handset requirements” was under discussion. However, far more interesting are the details of the discussions over the extension to the very short comment period on the waiver request in November 2010 (pp13-15 of the PDF). It is clear that the FCC had essentially already agreed the waiver with LightSquared and had “discussed [the timetable] previously”. The FCC was working to this “tight” timetable (later derailed by NTIA concerns about GPS interference) so that order could be issued on December 20, a date that was described as “critical”. Of course (although it is not stated in the emails) the reason that this date was so critical was that (as I suspected at the time), the Commission intended to (and did) vote on net neutrality rules at the December 21, 2010 Open Meeting, which excluded wireless networks from net neutrality obligations. As a result, if the FCC had been able to announce the LightSquared waiver at that meeting, it would have been possible to say that at least one major 4G network provider had signed up to net neutrality principles of its own accord, effectively endorsing LightSquared as a competitor to the major cellular operators. Despite considerable efforts by Charlie Ergen, it looks like the Softbank deal may now have enabled Sprint to escape from the box of constrained capital, limited spectrum and a second rate network that Sprint could have been confined to, if it had failed to gain access to either usable H block spectrum or Clearwire’s network on economically advantageous terms. Many thought that Sprint would move to purchase Clearwire immediately after the Softbank investment, but today sources are denying that is the intention, stating that Sprint has no intention of taking part in mergers or acquisitions until the Softbank deal is finalized in mid-2013. This timeline also implies that Sprint will not move to disrupt the T-Mobile/MetroPCS merger, which is expected to close in 2013Q2. So the obvious question is why did Sprint need to issue a $3B convertible bond to Softbank right now? I think that can only be intended to warn off others from doing a deal with Clearwire in the interim, by offering John Stanton the carrot of improved economics and/or further investment from Sprint. Of course there are not many options for Clearwire to sell spectrum, now that T-Mobile and MetroPCS, the two operators most frequently rumored to have designs on Clearwire’s spectrum, are getting together. As a result, I think Sprint’s actions appear to confirm that Clearwire was about to pull the trigger on a deal with Ergen, as I suggested last month, involving an asset sale and/or WiMAX customer transfer, in exchange for a combination of cash and debt. Notably, receipts from a sale of network assets (as opposed to a spectrum sale) would not have to be used to repurchase Clearwire’s first lien debt, suggesting that this could be a preferred way for Clearwire to raise funds. In addition, I’m told Ergen now holds in excess of $900M of Clearwire’s debt (not all first lien), and some of that could potentially have been traded for Clearwire spectrum. Reports on the Sprint/Softbank deal have also suggested that both Carlos Slim and SK Telecom have considered investments in Sprint, and it is worth noting that SK Telecom invested $60M in LightSquared back in 2010, while Slim is rumored to be buying LightSquared debt. In fact I’m told that further significant purchases of LightSquared debt have taken place in recent weeks. If one or both of those two players therefore continue to maintain their interest in US telecom assets (which has obviously included MSS-ATC spectrum similar to that held by DISH), then Ergen may be the last, best potential partner available. So has Sprint now prevented Ergen from achieving a deal with Clearwire? I’m told that (at least with the current ownership situation) Sprint would have no ability to veto such a transaction, so presumably Stanton will now be trying to extract vastly improved economics from the existing capacity agreement with Sprint in order to forego a DISH deal. What concessions will Sprint be prepared to make, and if it does give ground, where does that leave DISH? After all, it doesn’t seem that AT&T is prepared to pay Ergen’s asking price (perhaps as high as $80-$90 per share?) to purchase the whole of DISH anytime soon. Ergen must certainly be fuming at how FCC delays have prevented him from moving forward, while potential partners seem to be rapidly exiting the dance floor. At least he appears to have made a profit on his investment in Clearwire, but that may be little consolation if it now proves more difficult to find a way to monetize DISH’s other, much larger, spectrum investments. One would assume that the FCC Chairman regards the CTIA as experts, because after all they have been amongst the foremost cheerleaders for the spectrum crunch over the last three years. Indeed, upon releasing their latest wireless industry statistics, CTIA’s press release on Thursday proclaimed that “Wireless Network Data Traffic Increased 111 percent and Highlights Industry Need for More Spectrum”. 3) data caps beginning to impact some high end users. According to the CTIA survey, total wireless data traffic in the US in the first six months of 2012 was 635B Mbytes, up only 21% on the 526B Mbytes recorded in the previous six month period. 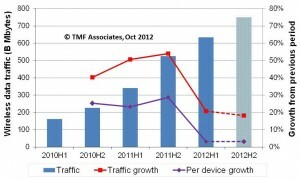 This compares to the 54% growth seen in wireless data traffic between H1 and H2 of 2011, and the 51% growth in traffic between 2010H2 and 2011H1. Even more remarkably, with the number of smartphones and wireless connected tablets growing by 16% between 2011H2 and 2012H1, data traffic per device was only up about 3% (based on the average number of devices in each 6 month period), compared to 29% between H1 and H2 of 2011 and 23% between 2010H2 and 2011H1. 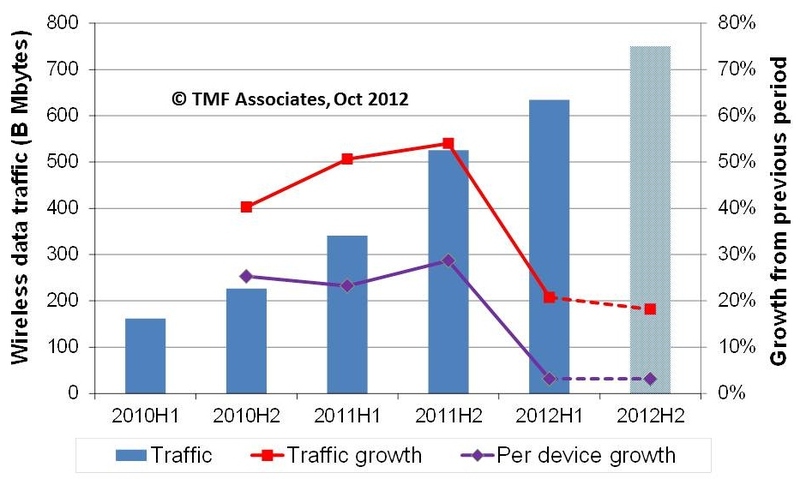 As shown in the chart below, if we extrapolate this same growth in traffic per device to the second half of 2012, then total data traffic during the period will be about 750B Mbytes, and total traffic for 2012 will have increased only 60% compared to 2011. That is only half of Cisco’s Feb 2012 estimate of 118% growth in North American mobile data traffic between 2011 and 2012, and would clearly force a complete re-evaluation of future traffic projections. However, just from the data in the first half of 2012, we can already see that traffic growth is clearly not “exponential” and has now passed its peak. More importantly, if growth in traffic per device has been brought under control, then a spectrum crunch is no longer possible in the foreseeable future, because smartphone penetration is already approaching saturation. As others have pointed out, “there is no more scarcity of wireless spectrum than there is a shortage of, say, the color purple”. Its therefore perhaps ironic to note that back when the last Emperor Julius (Caesar) was in charge, “virtually every expert confirmed” that the color purple was expensive, difficult to find and limited by regulatory fiat to a tiny elite group. 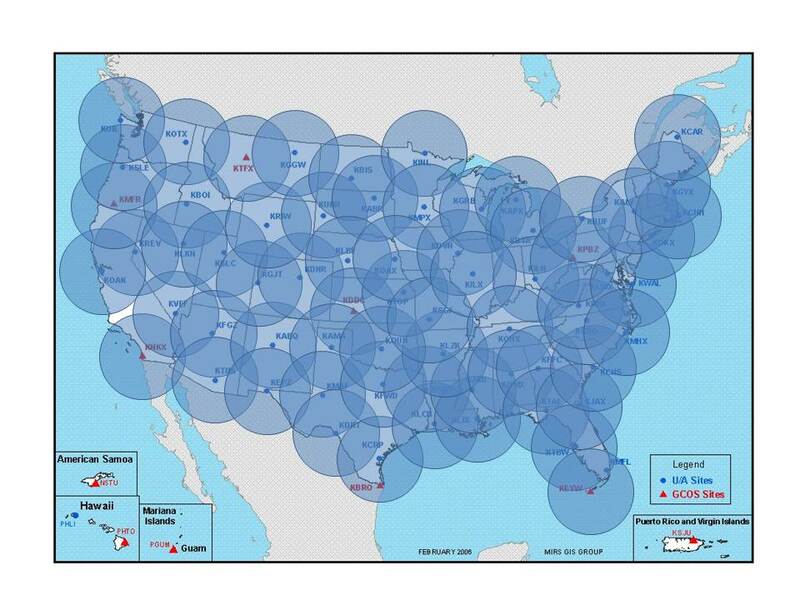 As far as I know, no-one has pointed out that these “few sections of the country” where LightSquared would have problems using the 1675-80MHz band it has asked to share, actually include 69 fixed radiosonde launch stations in the lower 48 states (plus additional mobile launch sites when severe weather conditions such as hurricanes are anticipated), from which the weather balloons can drift 180 miles or more, depending on which way the wind is blowing. 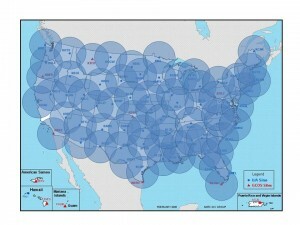 A quick look at a map of these locations shows a near uniform distribution of sites around the country and that a 180 mile exclusion zone around each station would make it impossible to provide service almost everywhere in the US. Of course in the past LightSquared demonstrated its skill at predicting and even controlling which way the political winds were blowing. So maybe they now intend to see if that capability extends to real life weather as well?